ESI presented its new sound card called Juli@ at the world-famous exhibition Musikmesse (March 31 – April 3, 2004) in Frankfurt, Germany. The card is shipped in a nice box made as a book with a transparent inner side. 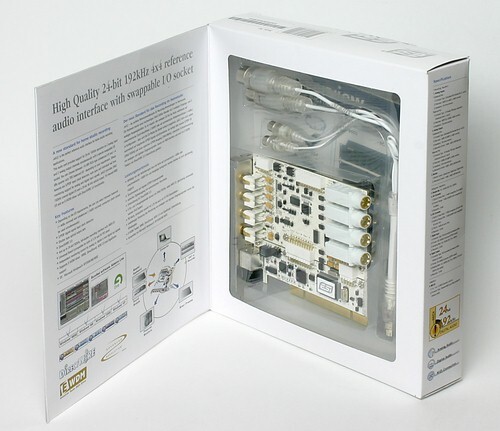 The unique feature of this card is the opportunity to transform it to user's needs: you can choose which jacks to use – professional 1/4" balanced jacks (1/4" TRS) or consumer RCA jacks. The main DSP chip labeled with the ESI logo is VIA Envy24HT-S (24-bit, 192 kHz; interfaces: three output I2S/AC-links, two input I2S/AC-links). 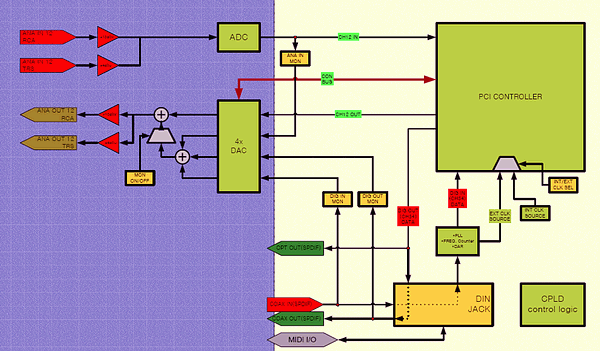 Digital transceiver – AKM AK4114 (8 inputs, 2 outputs). The card uses an 8-channel multibit 24-bit 192 kHz DAC AKM AK4358 with reduced sensitivity to jitter, positioned by AKM for professional equipment as well as for consumer DVD-Audio and SACD (by the way, I wrote about the release of this DAC in our news a year ago). Dynamic range: 112 dB. THD+noise: -94 dB. 8 times 24-bit digital filter with an slow roll-off option (in this case this option is disabled to provide ideally even frequency response). DAC is not a top class, but quite good enough for a sound card in this price range. 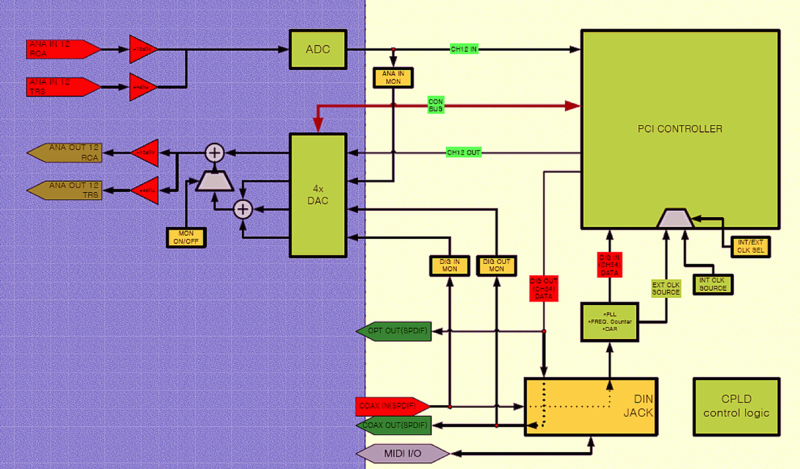 You can see on the ESI Juli@ block diagram that the 8-channel AKM 4358 DAC (marked as 4õ DAC) is used in this sound card on purpose — it monitors digital I/O with an absolute zero delay. ADC – dual bit delta-sigma stereo 24-bit 192 kHz AKM AK5385A has a little better characteristics; it is positioned by AKM for professional equipment to record audio in high definition formats, including DVD-Audio. Dynamic range: 114 dB. Signal/(noise+distortions): 103 dB. High-quality digital antialiasing filter with a linear phase, passband (Fs=48 kHz): 0~21.768 kHz, ripple: 0.005 dB, stopband: 100 dB. Some comments. Though DAC and ADC are of the same class in this sound card, ADCs are still a tad better than DACs. Perhaps, as it was with Waveterminal 192X, the engineers considered the digitization quality (ADC) to be more important in home/project studio than the slightly reduced quality of signal monitoring, other things being equal. But hi-end audio PC users (RCA jacks are a curtsy to them), who use their computers solely for high quality playback and who do not care about ADC, have a reason to pause – is the DAC comparable with the level of the rest of the sound playback section? If the rest of the sound section is much more expensive than the card (approximately over $600), so that the bottleneck is in the DAC quality as well, then they should pay attention to the mastering level sound cards. In general, it should be noted that in the price range up to $200 Juli@ demonstrates better DAC/ADC quality in comparison with similar old cards based on ENVY24 – various M-Audio Audiophile 2496, Echo MIA, etc. According to our measurements (using the same reference sound card) Juli@ is even better than the more expensive ESI Waveterminal 192Õ, which has better (according to the specification) ADCs. So in our opinion only EMU 1212M (with converters of a higher level) can be a serious competitor to the undoubtedly successful in price/quality Juli@. 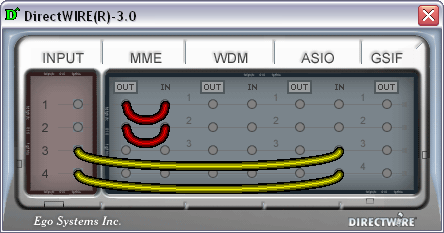 Despite this fact, many users of middle end sound sections will quite possibly prefer Juli@, because this ESI card is easier to control, it does not have problems with the MME/WDM interface support in high formats, it has a smoother frequency response of line outs, and it offers several useful proprietary features, which will be described later. Besides, EMU is very difficult to find on our shelves and this situation has not changed for half a year already. E-WDM technology (Enhanced Audio MIDI Driver) is a proprietary project of ESI, which enhances the original architectural concept of Microsoft WDM-drivers. Based on the WDM architecture, E-WDM drivers work fine under all WDM compatible Windows operating systems, while WDM drivers of other sound cards often work only in W2K and XP, offering VxD drivers for Win98SE and ME. From the very beginning E-WDM drivers were developed for professional applications. The popular software sampler GIGAStudio from Tascam is fully supported with the extremely low latency of 1.5 ms.
ASIO 2.0 is the de facto standard, and E-WDM supports it with just a 3.0 ms latency. Several MME applications can be used simultaneously, and the drivers will not complain that the device is busy. This is also useful for old applications, which are not supported by WDM drivers. An unlimited number of audio applications can be accessed simultaneously with the multi-client support. You can use SONAR and WinAmp via a single sound device. It supports 5.1 output format for software DVD-Video players, such as WinDVD and Power DVD. This function is also useful for WDM applications, such as SONAR, especially in terms of the input/output channel synchronization. WDM-based multi-channel MIDI-driver from ESI offers a more stable timing than the built-in MIDI-timing in NT4 or Windows 9X. E-WDM offers support for several DirectSound channels for multi-channel output in such applications as PCDJ (DJ software). Unlike the situation with several other drivers, E-WDM guarantees the signal level exactly according to the existing standard. E-WDM drivers provide comfortable work due to the minimal latency. Buffer size can be set in drivers. DirectWIRE is a technology for visual software routing of signals, which is currently available in most ESI products. Signals are routed on the level of drivers, bit-to-bit, without quality loss. DirectWIRE 1.0 technology appeared in ESI Waveterminal 2496/192 when the Gigastudio sampler was still widely popular and initially it served to convert MIDI-tracks to WAV from Gigastudio (GSIF interface) into Cubase (ASIO) or into Cakewalk/SONAR1 (MME). DirectWIRE 2.0 supports 32 channels, it has a new control panel, and an option to mute monitoring of selected output channels. You can switch inputs and outputs of the MME, WDM, ASIO, GSI/F program interfaces, even if they work simultaneously. You can connect inputs and outputs of different applications with virtual cables and record signals without quality loss. Using DirectWIRE you can also record multi-channel audio from DVD or another source (even protected from copying) in formats up to 24-bit 192 kHz in real time in completely digital form. 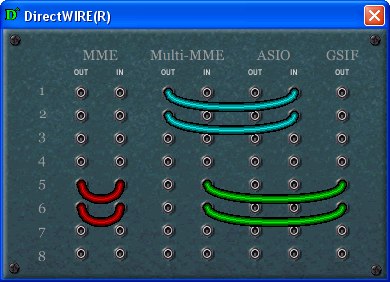 DirectWIRE 3.0 was enhanced with hardware inputs. In Juli@ Virtual Inputs 1 and 2 are the left and the right hardware analog inputs, 3 and 4 – the left and right hardware digital S/PDIF input. MME: WinAmp, CoolEdit, Cakewalk, Vegas, etc. WDM: SONAR (WDM/KS), PowerDVD, WinDVD, etc. 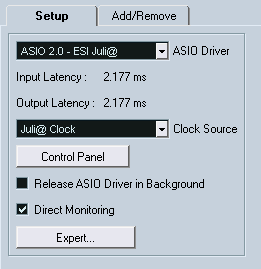 ASIO: Cubase, Nuendo, Logic, Reason, SONAR (ASIO), etc. GSIF: GigaStudio 2.42 or higher. You can read this Audiotrak tutorial to learn how to use DirectWIRE 3.0 with detailed examples. Juli@ stands out against other ESI products with its MIDI I/O, digital RCA I/O, and a digital optical output. You had to buy a separate MI/ODI/O module to get these features in Audiotrak MAYA44MKII and ESI Waveterminal 192X/L. Though there are also modifications with MI/ODI/O module in a box now, it occupies an additional bracket among PCI slots. These two cards can be compared due to similar prices ($185 for the ESI product and $240 for the Creative product) and professional attributes (external block with a full set of connectors) in Audigy, which is essentially a gaming card. Functionality of Juli@ and Platinum Pro in terms of a microphone preamplifier and phone-in can be leveled up by adding an inexpensive external analog mixer (about $50) to Juli@, but it's quite possible that an external mixer is already available in home/project studio. Before the comparative audition I had no subjective preferences – the cards have converters of the same class, and thus I didn't expect considerable differences in sound quality. Nevertheless, the difference between the cards can be clearly heard even using the active speakers JetBalance JB-381 (by the way, very good speakers at a moderate price at last, less than $200). In the 16 bit 44 kHz mode A2 is traditionally weak at playing via the MME interface, and it's much better at playing via the professional packaged "SB Audigy2 ZS ASIO" driver with enabled SSRC high quality resampling to 48 kHz. But Juli@ produces crisper and more detailed sounds, and thus it's more suitable for a professional. Though this can be heard only when you instantly switch between the cards playing the same music fragment. If you increase the time between the auditions to a couple of minutes, you won't be able to distinguish the cards even with the same music fragment. One way or another, I clearly hear the difference, for example at Alex Reece, 1996 album "So Far" (hits: Feel The Sunshine, Pulp Friction) and some other test compositions with clear compressed mastering and timbre-catchy high frequency range. Despite the high price ($400) and the increased number of channels in EMU1820, Juli@ can compete with it head-to-head, because the Creative/EMU product has converters of the same level (CS4392). Both cards, Juli@ and 1280, were tested in balanced mode, high signal level (+4 dBu) to increase the dynamic range and to demonstrate sound cards' features at maximum. The auditions were also carried out on EVENT 20/20 bas monitors, allowing the balanced connection. Thorough audition in the same conditions, using the same cable and instantly switching between the cards did not reveal any difference in their sounding. However, considering the high price of EMU1820, it cannot be called a successful sound card – it's an economic modification of the elder 1820M. 1820 is of lower quality than even the younger 1212M model. Forestalling your questions: we don't have an opportunity to compare it with EMU 1212M or 1820M, because these cards cannot be found on sale in Russia. US EMU office promised to send us a press-sample, but we lost contact with it. If we still have an opportunity, we'll update this article. Comparison with LynxTwo (price >$1000, stereo-modification is Lynx L22, >$800) in our tests is traditional, it serves to reveal the degree and character of sound differences between a sound card under review and a reference sound source. We hasten to say, LynxTwo sounds better. The difference is not so large but it still makes itself felt. Nevertheless, Juli@ demonstrates professional sound quality in comparison with the reference. Multimedia cards (for example, Audigy2/ZS) are usually infamous for timbre distortions, various tones and harmonics at high frequencies. So despite their rather high quality converters, such cards cannot be used for professional work. Juli@ is free from these drawbacks, it sounds true and clear. The only difference from Lynx is in a tad lesser detail, which will hardly influence its professional capability, except for the mastering. Despite the fact that this card does not have a separate output to headphones, they can be connected using the 2RCA-minijack adapter. Using Sennheiser HD600 (400 ohm impedance) via the adapter caused no problems with sound. Besides, we carried out the following interesting experiment: we connected a variable resistor to the output, and applied a maximum amplitude sinusoid to the output of the card. On the digital oscillograph EZ Digital OS-310M we monitored how the amplitude changed and at what resistance there would be a limitation. In comparison with the pure linear output in MAYA44MKII with the limitation at ~100 ohm and lower, Juli@ was OK. Operational amplifiers JRC 4580 hold well the low impedance load, though the Juli@ specification requires the load impedance of not less than 100 ohm. By the way, MAYA44MKII has an output for headphones, which is also OK.
No surprises here. As any sound card based on the ENVY24 series chip, Juli@ demonstrated excellent results in ASIO-applications CubaseSX 2.0.1 and WaveLab 5.0a. Besides, InterVideo WinDVD 6.0 works correctly with the card as well. When playing DVD-Audio discs, they are downsampled to 16/48. Many users ask us to test not only the quality of linear output, but that of the linear input as well. It is especially important for professional equipment, so we tested the card in three modes: when the output and the input of the card are connected, input and output are connected separately using LynxTwo – a reference card of a higher quality. When the linear input is tested in the balanced mode using LynxTwo, the frequency response gets worse in this test as well as in all the other ones. In the loopback mode (when the output and the input of the card are connected) there is no such drawback, thus we have some disalignment in the operation of balance interfaces in this specific device combo. This is another reason not to use balance connection needlessly. Note the ideally steady frequency response graph and the ideally clear noise spectrum in the 24-bit mode. The noise level measured is close to the claimed figures in the converter specifications. Engineers made the most of the existing converters. In the 96 kHz mode the spectrum is reproduced completely, as it should be. I'll remind you that EMU cards have problems with frequency response in DAC, which is -0.7 dB for 20 kHz. In digital output tests Juli@ is equal to LynxTwo. In the 24/96 mode the ideal is even farther from our contenders. 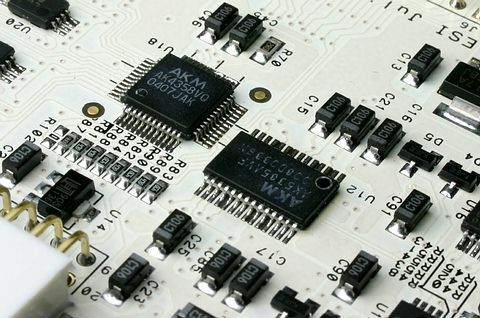 The reason is most likely not in the lack of bit-to-bit transfer precision, but in the PLL influence in the transceivers or in dithering reformation. One way or another, it's impossible to hear the difference between the original and the received sound – the differences are below the thermal noise threshold in semiconductors, and any digital-analog conversion will guarantee much more audible inaccuracies – the native level of noise in modern DAC is hardly over 120 dB A. We test DirectSound functions of the card, because we have such an opportunity. RM 3DS tests demonstrate DirectSound compatibility but also the lack of any algorithms of software 3D sound. Just for information. Audio transfer speed (software): 3.289 Mb/sec. with the ESI R&D team! 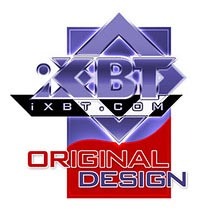 iXBT.com: How did you come up with the idea to produce such an unusual sound card with a unique design as Juli@? Is it an attempt to stand out against similar sound cards and to attract attention? What was the reason to break away from the multichannel solution, which we saw in Waveterminal 192L/X (Waveterminal 2496 descendant)? ESI: Our main goal of developing Juli@ was making a reference model card in terms of audio quality. We did research the market and the already available products. We found that users would need either balanced or unbalanced I/O connections, preferably with the same number of input and output channels, but all products are supporting only one of each connector type. We came up with Juli@ with such a unique design with the user's needs in mind so that the I/O connections will be swappable between balanced and un-balanced. ESI plans to release new multi-channel solutions in the near future. iXBT.com: What was the criterion to select the certain ADC and DAC models (AKM 5385A and 4358)? Why did you choose the 8-channel DAC (AKM4358)? ESI: We have been using the AKM4358 in development of other products such as the upcoming Audiotrak MAYA1010. We really liked the quality of AKM4358 so it was our conclusion to use it also for Juli@ despite the number of channels. This made it possible to use the additional channels to provide real-time monitoring for all S/PDIF and analog I/O signals, providing more functionality. As for the ADC, we always try to use the best available components, as recording is more important than playback for most professional users. iXBT.com: Did you choose during development a certain price/quality threshold, in order to reach a predetermined price (MSRP), or do your engineers preach some principle of reasonable sufficiency in the area of quality? ESI: Of course reaching a specific price is always a concern during development. In case of Juli@, functionality and audio quality have been the highest priority. We are very glad that the final product is now available with a very competitive MSRP. iXBT.com: How do you feel, at what rates do the high sampling audio formats evolve in the area of music production and their demand by listeners/customers? 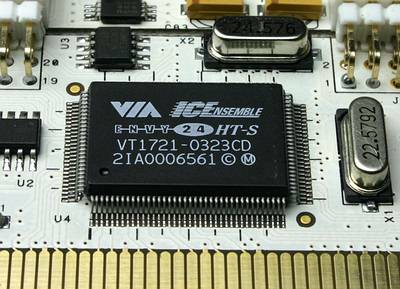 ESI: When we started to sell 24bit audio cards several years ago, most of our professional users started immediately work with 24bit/44.1kHz. The higher resolution compared to previous 16bit products was a huge increase in audio quality useful for music production, even if the final product was just a 16bit/44.1kHz audio CD. Now, professionals are slowly starting to work with higher sample-rates in the production process, not only with the higher bit-rate. New formats such as DVD (audio or video) or SACD even require higher sample-rates in the production process; so many professionals are working with 96kHz or even 192kHz already. ESI supports these professionals not only with soundcards but also with exciting new concepts, such as our M-Fire M9600 24bit/96kHz DVD Master Recorder. These days, when we talk to the members of our professional user community, we can see that the demand for a higher recording quality standard is getting more and more important, although we have to admit, that this is a considerably slow process. Many professionals are also buying higher spec hardware because they understand that higher spec hardware also works better even when working with lower samplerates. For example, our 24bit/192kHz Juli@ will produce better results when used with 24bit/44.1kHz compare to other 24bit/96kHz devices, simply because of the much better ADC and DAC. For consumer products, the need to support 96kHz, or even 192kHz, is growing at the same time, mostly because of the necessity to playback already available consumer media. 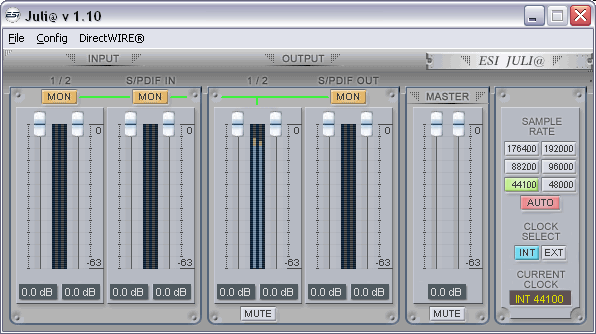 Windows Media Audio Professional supporting 24bit/96kHz is already a standard for PC audio. As more and more professionals are producing music and media content for higher bit and sample rates, the actual demand for consumer products that support these features is also growing. Still, it is not growing that fast, probably because of the reluctance of large media corporate to invest into better audio quality without having working Digital Rights Management solutions market ready. iXBT.com: Can you tell us anything about the upcoming new generation of built-in sound named High Definition Audio replacing AC'97? Does it threaten high-quality soundcards supporting high sampling formats, or on the contrary will it draw attention to the high quality sound and promote high-quality sound devices? ESI: We are aware of the HD Audio which sounds promising. But, from our experience in the past, we suspect that there always will be some limitations of on-board sound card. Most main board manufacturers will have to make compromises which will possibly lower the audio quality. We have evaluated the Azalia (former codename for HD Audio) demonstrated at the recent COMPUTEX Taipei 2004. There was certainly improvement on specification over the outdated AC97. However, we thought that it was not that impressive quality and not superior than AC97. We are confident that optional soundcards will be available in the future, probably mostly for audio enthusiast and of course for professionals. Audio still faces huge competition from leading companies and still doesn't provide a full substitute solution for high performance 3D audio and popular gaming surround sound standards such as EAX, Dolby Digital surround, and features like Advanced NSP, the ESI's solution to the native CPU processing for PC Audio. iXBT.com: What is your opinion of the E-MU revival in the sector of sound cards (especially the 1212M and 0404 models)? How you do evaluate DSP features and the quality of converters in these sound cards taking into account their prices? Will ESI respond with a solution featuring top-end converters at an affordable price? ESI: We generally believe that onboard DSP solutions on audiocards will soon be history. Solutions like VST plugins or DirectX effects are providing excellent results for professional and even ultra high end professional effects, based on native CPU processing. Modern PCs are easily fast enough to provide better sounding effects and software synthesizer sounds compared to current DSP solutions. Right now, we are just at the beginning of this development - in the future, there will be less and less DSP based products in the audio market and native processing solutions will get even more important. In today's native processing environment, it is obvious that the value of a powerful driver providing low CPU load and low latency is considered much more valuable by professionals, compared to onboard DSP hardware. We also believe that we have developed a great value for audio professionals and audio enthusiasts with Juli@ - currently one of the best solution on the market for digital recording because of its exceptional circuitry design. The excellent frequency response is unmatched by any other products in this and even in higher price ranges. Yet, Singapore based Creative Labs has - with some of their E-MU brand products - achieved high dynamic range values on the input section - it is up to the customer if he prefers a good frequency response or a slightly higher dynamic range, just depending on his specific needs. Of course, ESI will provide even better AD and DA conversion quality for future professional audio products, e.g. with our upcoming multi-channel solutions. ESI was one of the first companies to introduce 192kHz and 7.1 channel sound cards and we will continue to introduce new standards and features first. Other examples are the unmatched features like our universal E-WDM drivers and of course DirectWIRE, a virtual digital routing solution with zero latency, exclusively available for users of ESI and Audiotrak products. iXBT.com: How is ESI getting on? Should we expect new interesting products, such as Juli@, in future from ESI engineers? Can you share some of your plans with us? ESI: Actually, ESI is currently mostly focusing on developing products that are more market-friendly. For consumer products, Audiotrak brand will release LP (Low Profile) type products which will inherit all the available features in a half sized PCI board and which will fit nicely in a small form factor PC cases. We have the new MAYA 1010 waiting to be released behind the corner but these might not be as special as Juli@. We do plan to design a variety of rack casings to give our users more connection possibilities, both for the consumer and professional music markets. Our drivers and control panels will always have ESI exclusive original features like E-WDM and DirectWIRE which have been as interesting to many people as Juli@'s brilliant swappable hardware design. iXBT.com: We thank the entire ESI R&D team and personally Nikki Kichan Kang for the interview! Professional sound card ESI Juli@ has an unusual design, it features both professional and consumer connectors, full MIDI and digital interfaces, high quality playback, excellent drivers, quite a reasonable price, and it is available on sale. Taking into account its price and professional orientation, we found no drawbacks in this card. ESI engineers did a good job, but one can never stop at what has been accomplished – we are looking forward to new sound cards from ESI/Audiotrak with higher quality DACs, which will compete with EMU products of the same price range. ESI Juli@ gets the "Original Design" award according to the test results. We thank ESI for the kindly provided sound card ESI Juli@.